I'm still trying to understand the details of how cryptocurrencies like Bitcoin work. But the general principles involved seem clear enough, so let me start by explaining (what I think) these are. I'll let the experts out there fill in the gaps (and correct any errors I may have made). So what follows is basically an introductory lecture I would deliver to a class on the subject. How to manage the total supply of credits over time. I mention this idea of "communal monitoring" because some form of it seems to play a critical role in the practical application of the Bitcoin protocol. As a practical matter, the "social credit" system described above seems to work well for small groups, but not so well for larger communities. It's tough to keep track of the individual credit histories of thousands or millions of people, let alone ensure that such records remain a true representation of history. In large communities, many individuals become "anonymous" to one another. Anonymity here means that anything they do in a transient bilateral meeting will not be observed and recorded by the community. That's too bad because efficiency may have dictated that a gift be made in such a meeting. The gift might have been made if the gift-giver received (a social) credit for his/her sacrifice. But if no social credit is forthcoming (because nobody can see it), then the trade does not take place, even though it should have (in an ideal world). One solution to this problem is monetary exchange. That is, imagine that there exists a set of durable, divisible, portable, recognizable physical object that is hard to steal/counterfeit (the way that reputations need to be hard to steal or counterfeit). Then contributors (workers) could build up credit by accumulating this object, and recipients (consumers) could draw down their credit by spending this object. As it circulates in this manner, this object becomes money. According to this interpretation, money is nothing more than a substitute for the missing (excessively costly) communal record-keeping technology (see Ostory 1973, Townsend 1987, and Kocherlakota 1998). In a monetary economy, there is no explicit communal monitoring going on. If money is difficult to steal/counterfeit, then the only way I could have acquired it is by working for it (or by having someone else who worked for it bequeath it to me as a gift). When I show up at my local Starbucks and ask for a triple grande latte, they won't hand over my drink until I show evidence my contributions to society. The evidence is in the form of the money that I earned from work. As I hand over my money, I debit my wallet and credit the Starbucks wallet. This transfer of credits involves no intermediary--it is a "self-serve" accounting mechanism. Of course, many exchanges do take place via intermediaries like banks and clearinghouses. A check drawn on my bank account is an instruction to debit my account and credit another account. The accounts sit on the books of a third party--the intermediary. The money in this case need not even take a physical form -- it can exist simply as a book-entry object. Today, these book-entry objects take the form of electronic digits, and these digits are debited and credited across accounts managed by banks with instructions from debit card technology. O.K., well suppose that you do not trust the government (or central bank) and their paper money. Suppose you want the convenience of electronic money (so no commodity money). And moreover, suppose you do not want to rely on a third party like a bank. Maybe you don't trust them, or you do not like their fees, or the records of your purchases they keep, or the fact that your identity is associated with your account. What is the alternative? What we want is some way to replicate the cash experience using electronic digits instead of physical currency. Recall that in bilateral cash transactions, the accounting is done on a self-service basis without the help of the community or some other third party. When it comes to digital money transferred over the internet across a large network of users, self-serve accounting is not likely to be practical. The self-serve part will have to be replaced by some communal monitoring service (obviously not a delegated third party, since this is what we are trying to avoid). I'll try to explain why in a moment, but first let me considered an idealized world where the relevant information is costlessly accessible to all members of the community. Digital cash consists of information encoded electronically as bits. For concreteness, let's call digital cash "e-coins" and assume that an e-coin takes the form of a unique N-digit serial number. [A1] Assume that the serial numbers of every e-coin created are recorded in a public data bank for all to see. There is an initial money supply (50 bitcoins in the case of the Bitcoin protocol) and a publicly known protocol that governs money creation. In a nutshell, money growth can only occur by "communal consent." In the present context, you can think of monetary policy as a rule for money creation (and distribution), where the rule can only be changed by communal consent. Members of the community possess "computer wallets" where e-coins are stored in an encrypted file and managed by a computer app (you can download these programs for free). Computer wallets have a public address, like a P.O. box (the identity of the wallet is not known, and a person may own several wallets). So people can send money to your wallet, but only you can extract money from your wallet (only you possess a private digital key for this purpose). [A2] The e-coin content of every wallet is part of the public database. So here's how things might work. Suppose a buyer wants to send an e-coin to a seller. Essentially, the buyer sends a message to the community: I wish to send e-coin SN01234 to [seller's wallet address]. A digital signature ensures that this message could only have originated from the buyer's wallet. [A3] All messages are publicly observable. Now, if every member can costlessly scan and verify every element of the public database, the transaction process should be straightforward. First, the seller can see that the buyer does indeed own e-coin SN01234. Second, by comparing SN01234 to the public database of serial numbers outstanding, the seller can see that SN01234 is unique and was not counterfeited by the buyer. Third, the seller can see that the buyer is not trying to "double spend" SN01234 (e.g., by simultaneously offering it to another merchant's wallet). The practical problem with this protocol is not that information assumptions [A1]-[A3] are violated. The information is available. There's just so much of it that not everyone can be expected to absorb it all instantaneously. It is time lag that opens the door for scammers. The task of legitimizing, recording, and updating the database has to be delegated in some manner. In the Bitcoin protocol, the task is not delegated to any single third party, rather it is delegated to members of the community who wish to "volunteer" their monitoring services. Now, the precise details of how this public monitoring and record-keeping is done presently escapes me. The basic idea is that the monitoring activity must be made costly, because otherwise there is an incentive for scammers to announce that their scam deals (e.g., attempts to double spend) are legitimate. In Bitcoin, the monitors (miners) are required to solve a complicated mathematical problem (consumes energy and CPU time), the answer to which is easily verifiable. I think that (somehow) the verification of this answer also verifies the legitimacy of the transaction (someone help me out here). But if it is costly for miners to verify transactions, what motivates them to do it? There is a reward, of course. In Bitcoin, the reward comes in two forms: newly minted bitcoin and/or service fees. So in the Bitcoin protocol, the verification costs are partly financed via seigniorage. I do not understand the exact mechanics of this process, in particular, the cryptographic techniques involved, and how the parameters are varied over time (for example, to ensure that the supply of bitcoins never exceeds 21 million). Maybe some smart person can explain it to me in plain language. (Here is a good attempt). Before I leave this part of the discussion, I want to make a remark about the "mining" activity in Bitcoin. A lot of people, including Paul Krugman, appear confused about it. I initially shared in this confusion. Mining actual gold for the purpose of increasing the money supply is indeed socially wasteful. That's because an existing supply of gold can be stretched into an arbitrarily large supply of real money balances via an appropriate deflation. But the mining activity in Bitcoin is not a social waste--it is the cost associated with operating a payment system of this particular form when people have an incentive to cheat. The analog here is the cost associated with opening and maintaining your checking account at a bank. What accounts for this price volatility? (By comparison, the real rate of return on USD over the same period of time was a relatively stable -1% p.a.). 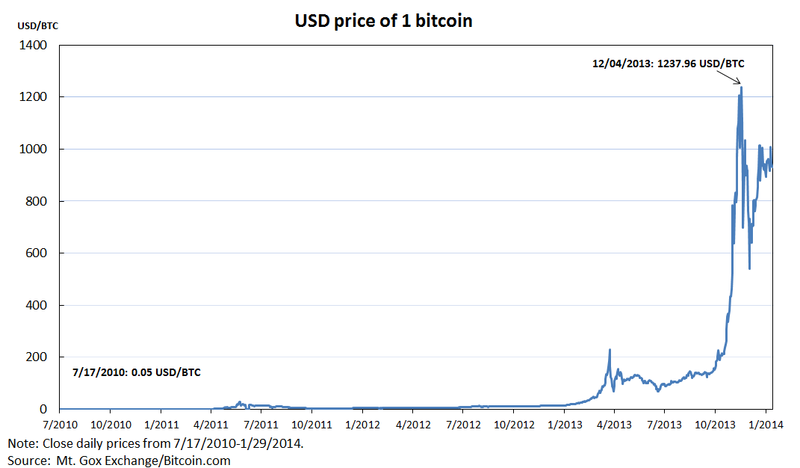 Well, it might have something to do with the thinness of the USD/BTC market (can anyone point me to some evidence?). Or it might have something to do with the fact that bitcoin is not a unit of account (even if it is a medium of exchange, prices are usually denominated in USD). Both of these problems might diminish over time as the popularity of the instrument grows. But my own take on this is that the price volatility reflects the perception that the supply of bitcoins is (relatively) fixed. This, combined with large fluctuations in the demand for bitcoin, naturally results in huge rate of return volatility. We saw the same thing under gold standard monetary regimes (where gold was a unit of account). In principle, an "elastic" supply of currency (even the credible threat of an elastic supply) can be used to offset sudden changes in demand to keep the rate of return (inflation rate) on money relatively stable. [B]itcoin protocol is based on open-source software. Bitcoin is what bitcoin users use. The general principles of bitcoin and its early versions are attributed to an otherwise unknown Satoshi Nakamoto; improvements, bug fixes, and repairs have since been carried out by the community of bitcoin users, dominated by a small set of programmers. Yes, it's hard to imagine. But maybe it's because we lack imagination? Only time will tell. According to this data, inflation expectations in the second quarter of 2013 declined significantly at all horizons. The sudden jump down in expectations in the summer corresponds with the sudden rise in Treasury yields associated with the so-called "taper tantrum" following the June 19 FOMC meeting. But it is interesting to note that immediately after the taper tantrum, inflation expectations recovered and stabilized, albeit at low levels (especially at the two and five year horizons). At the same time, nominal yields rose and remain elevated (with the 10 year hovering at or just below 3%). What is even more interesting the reaction of inflation expectations after the December 2013 FOMC meeting, where the taper was actually implemented (the timing of which came as a surprise to most market participants). 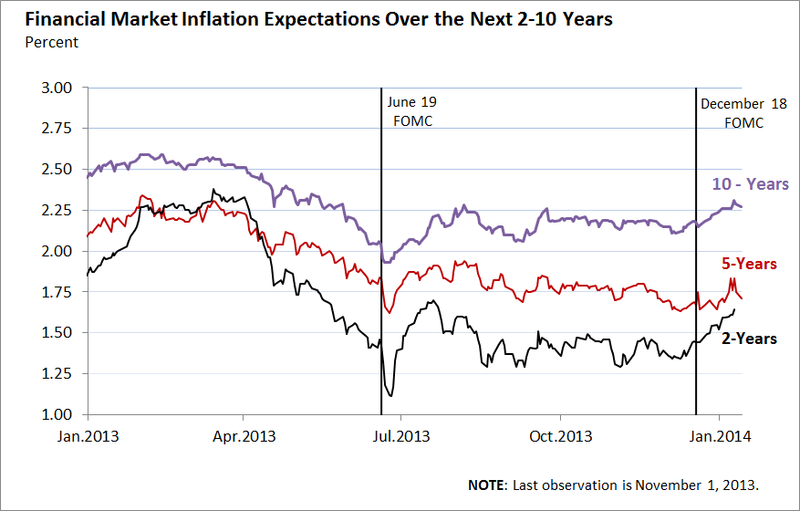 Short-run inflation expectations, in particular, appear to be on an upward trajectory. The effect is less evident at longer horizons. I'm not going to offer any interpretation of what economic forces are at play here (I'll leave it up to you to offer your take on things in the comments section). One thing I can say though is that this data will provide at least a small measure of comfort to Fed policy makers concerned about the threat of deflation. What is the OLG model of money good for? As I say over and over again, forcing your model to have microfoundations when they are the wrong microfoundations is not a progressive but rather a degenerative research program. Why is he saying this "over and over again" and to whom is he saying it? What if I had said "As I say over and over again, forcing your model to have hand-waving foundations when they are the wrong hand-waving foundations is not a progressive but rather degenerative research program."? That would be silly. And the quoted passage above is just as silly. A theory usually take the following form: given X, let me explain to you why Y is likely to happen. The "explanation" is something that links X (exogenous variables) to Y (endogenous variables). This link can be represented abstractly as a mapping Y = f(X). There are many different ways to construct the mapping f. One way is empirical: maybe you have data on X and Y, and you want to estimate f. Another way is to just "wave your hands" and talk informally about the origins and properties of f. Alternatively, you might want to derive f based on a set of assumed behavioral relations. Or, you may want to deduce the properties of f based on a particular algorithm (individual optimization and some equilibrium concept -- the current notion of "microfoundations"). Some brave souls, like my colleague Arthur Robson, try to go even deeper--seeking the biological foundations for preferences, for example. I don't think we (as a profession) should be religiously wedded to any one methodological approach. Which way to go often depends on the question being asked. Or perhaps a particular method is "forced" because we want to see how far it can be pushed (the outcome is uncertain -- this is the nature of research, after all). And I'm not sure what it means to have the "wrong" microfoundations. (Is it OK to have the wrong "macrofoundations?") Any explanation, whether expressed verbally or mathematically, is based on assumption and abstraction. Something "wrong" can always be found in any approach -- but this is hardly worth saying--let alone saying "over and over again." Yes, it seemed to me that handwaving was not good. But saying something precise and false–that we held money because it was the only store of value in a life-cycle context, and intergenerational trade was really important–seemed to me to be vastly inferior to saying something handwavey but true–that holding money allows us to transact not just with those we trust to make good on their vowels but with those whom we do not so trust, and that as a result we can have a very fine-grained and hence very productive division of labor. Not many people know this, but the OLG model (invented first by Allais, not Samuelson) is just an infinite-horizon version of Wicksell's triangle. The following diagram depicts a dynamic version of the triangle. Adam wants to eat in the morning, but can only produce food at night. Betty wants to eat in the afternoon, but can only produce food in the morning. Charlie wants to eat at night, but can only produce food in the afternoon (assume food is nonstorable). In the model economy above, there are no bilateral gains to trade (if we were to pair any two individuals, they would not trade). Sometimes this is called a "complete lack of coincidence of wants." There are, however, multilateral gains to trade: everyone would be made better off by producing when they can, and eating when they want to (from each according to their ability, to each according to their need). Consider an N-period version of the triangle above. Adam still wants bread in period 1, but can only produce bread in period N. Now send N to infinity and interpret Adam as the "initial old" generation (they can only produce bread off into the infinite future). Interpret Betty as the initial young generation (they produce output in period 1, but want to consume in period 2), and so on. Voila: we have the OLG model. 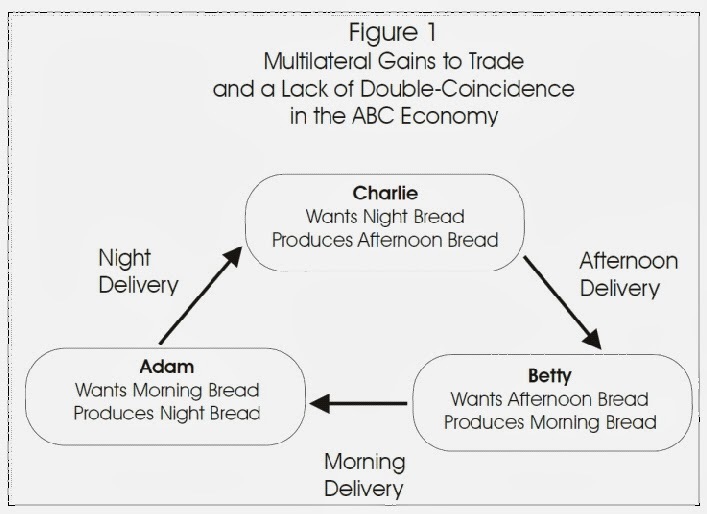 I've always considered Wicksell's triangle a useful starting point for thinking about what might motivate monetary trade (sequential spot market trade involving a swap of goods for an object that circulates widely as an exchange medium). In particular, while there is an absence of coincidence of wants, we can plainly see how this does not matter if people trust each other (a point that DeLong alludes to in the quoted passage above). 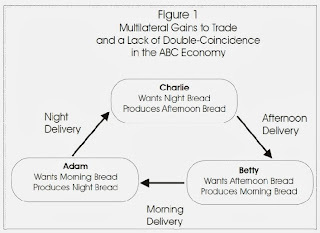 If trust is lacking--assume, for example, that only Adam is trustworthy--then Adam's IOU (a claim against period N output) can serve as a monetary instrument, permitting intertemporal trade even when trust is in short supply. An exchange medium is valued in an OLG model for precisely the same reason it is in the Wicksell model or, for that matter, any other model that features a limited commitment friction. So if anyone tries to tell you that the OLG model of money relies on money being the only store of value to facilitate intergenerational trade, you now know they are wrong. The overlapping generation language is metaphorical. In any case, as it turns out, the foundation of monetary exchange relies on something more than just a lack of trust. A lack of trust is necessary, but not sufficient. As Narayana Kocherlakota has shown (building on the work of Joe Ostroy and Robert Townsend) a lack of record-keeping is also necessary to motivate monetary exchange (since otherwise, credit histories with the threat of punishment for default can support credit exchange even when people do not trust each other). Are any of these results interesting or useful? Well, I find them interesting. And I think the foundations upon which these results are based may prove useful in a variety of contexts. We very often find that policy prescriptions depend on the details. On the other hand, I have nothing against models that simply assume a demand for money. These are models that are designed to address a different set of questions. Sometimes the answers to these questions are sensitive to the assumed microstructure and sometimes they are not. We can't really know beforehand. That's why it's called research. Finally, is a "rigorous microfoundation" like an OLG (Wicksell) model really necessary to deduce and understand the points made above? I suppose that the answer is no. But then, it's also true that motor vehicles are not necessary for transport. It's just that using them let's you get there a lot faster and more reliably.